Department of Computer Science and Engineering, Guru Nanak Dev University, Amritsar, India. Received November 17th, 2009; revised December 15th, 2009; accepted January 25th, 2010. In object oriented paradigm, cohesion of a class refers to the degree to which members of the class are interrelated. source software program. The metric data is then subjected to statistical analysis. types of all the methods in the class [9,10]. 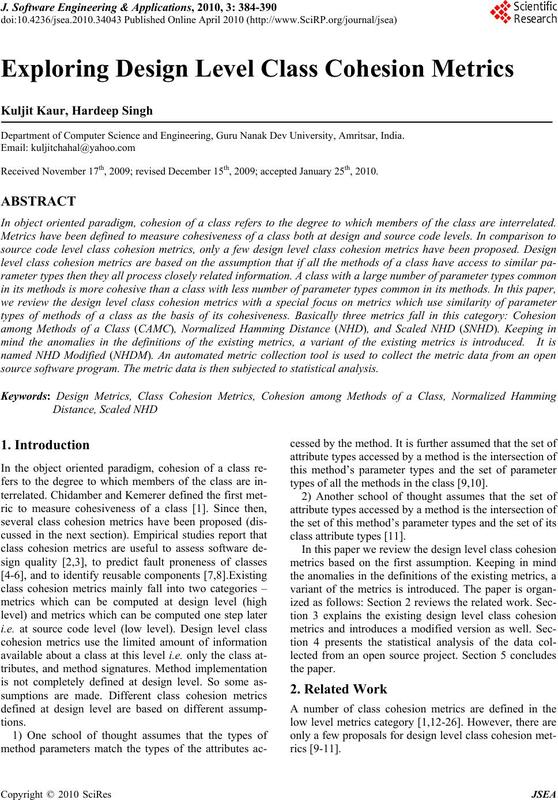 methods of the class use the same set of parameter types. does not support collection of this metric. parameter types, process closely related information. 1s in their PO matrices. metric than the larger classes with same properties. measures agreement between rows in the PO matrix. the parameter types and then subtract it from 1. (even if the PO matrix gets sparser). which of these extremes represents a cohesive class. 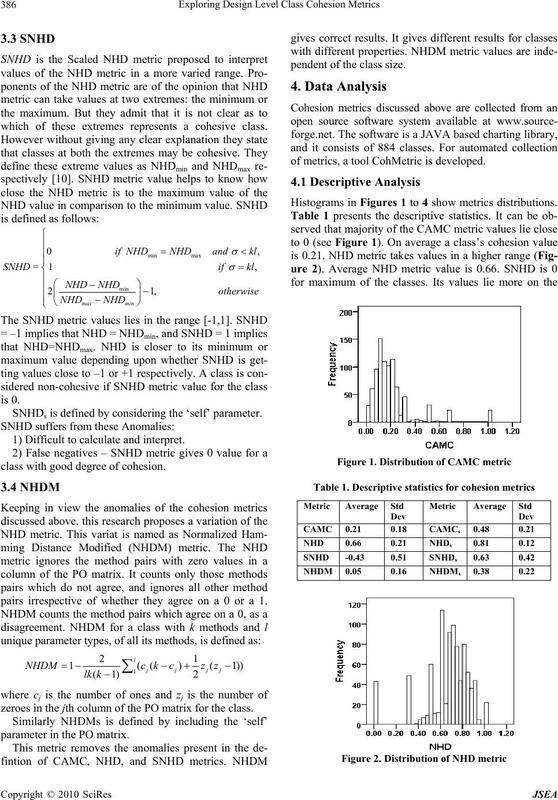 SNHDs is defined by considering the ‘self’ parameter. 1) Difficult to calculate and interpret. class with good degree of cohesion. pairs irrespective of whether they agree on a 0 or a 1.
zeroes in the jth column of the PO matrix for the class. parameter in the PO matrix. pendent of the class size. 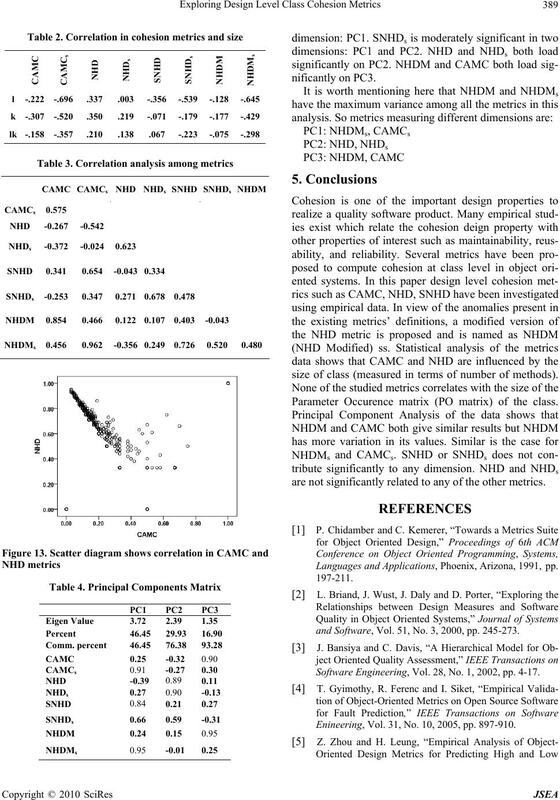 of metrics, a tool CohMetric is developed. 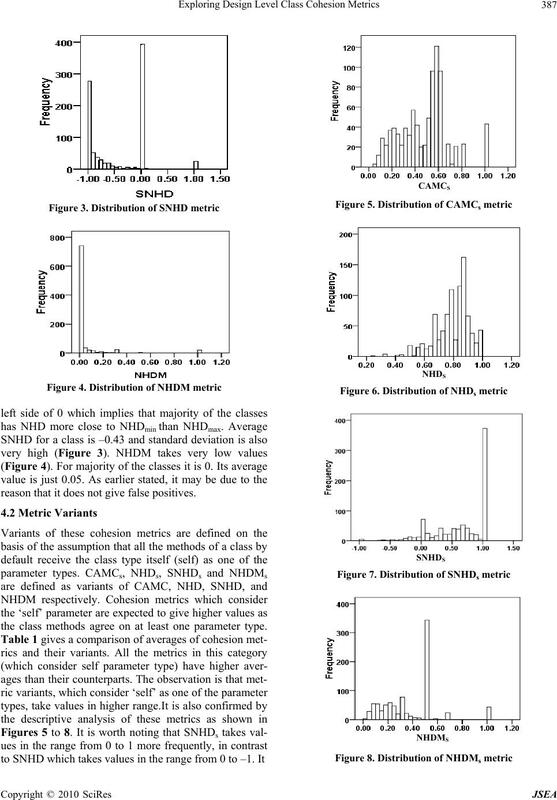 Histograms in Figures 1 to 4 show metrics distributions. reason that it does not give false positives. the class methods agree on at least one parameter type. vious studies on these metrics [10,27]. category. 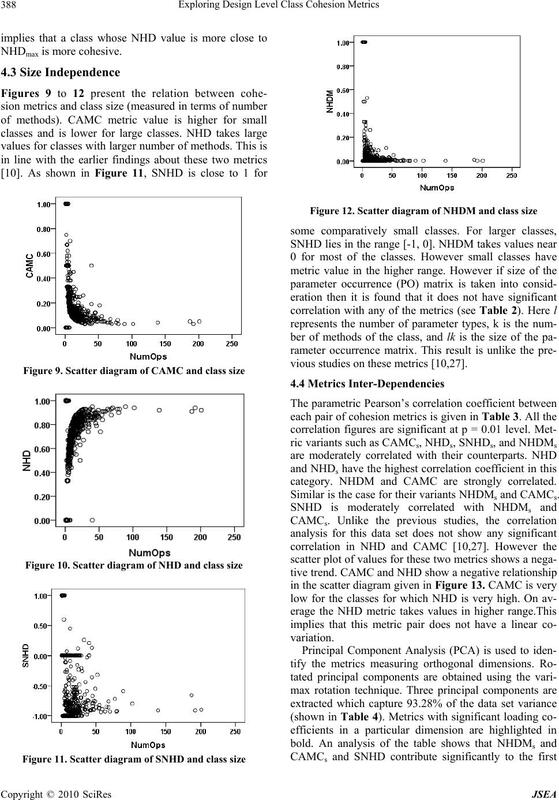 NHDM and CAMC are strongly correlated. Similar is the case for their variants NHDMs and CAMCs. size of class (measured in terms of number of methods). Parameter Occurence matrix (PO matrix) of the class. are not significantly related to any of the other metrics. Languages and Applications, Phoenix, Arizona, 1991, pp. and Software, Vol. 51, No. 3, 2000, pp. 245-273. Software Engineering, Vol. 28, No. 1, 2002, pp. 4-17. Enineering, Vol. 31, No. 10, 2005, pp. 897-910.
neering, Vol. 32, No. 10, 2006, pp. 771-789. Vol. 34, No. 2, 2008.
neering Conference, December 2001, pp. 79-86. Object Oriented Programming, Vol. 11, No. 8, 1999, pp. neering and Methodology, Vol. 15, No. 2, 2006, pp. 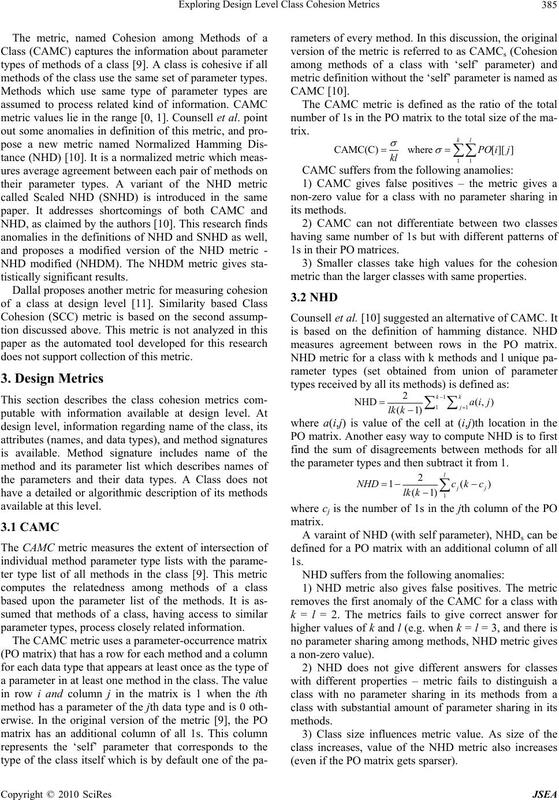 Maintainability,” Journal of Systems and Software, Vol. 23, No. 2, 1993, pp. 111-122. Engineering, Vol. 20, 1994, pp. 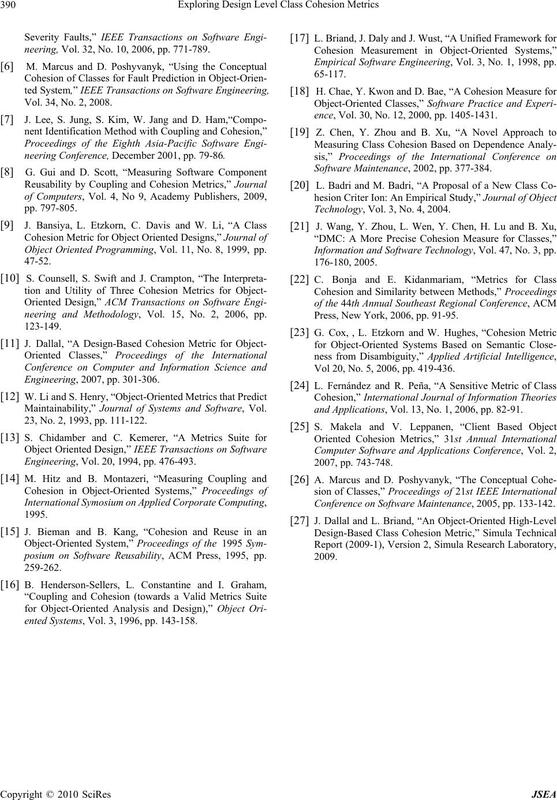 476-493.
posium on Software Reusability, ACM Press, 1995, pp. ented Systems, Vol. 3, 1996, pp. 143-158.
ence, Vol. 30, No. 12, 2000, pp. 1405-1431. Software Maintenance, 2002, pp. 377-384. Technology, Vol. 3, No. 4, 2004. Information and Software Technology, Vol. 47, No. 3, pp. Press, New York, 2006, pp. 91-95. Vol 20, No. 5, 2006, pp. 419-436.
and Applications, Vol. 13, No. 1, 2006, pp. 82-91. Conference on Software Maintenance, 2005, pp. 133-142.